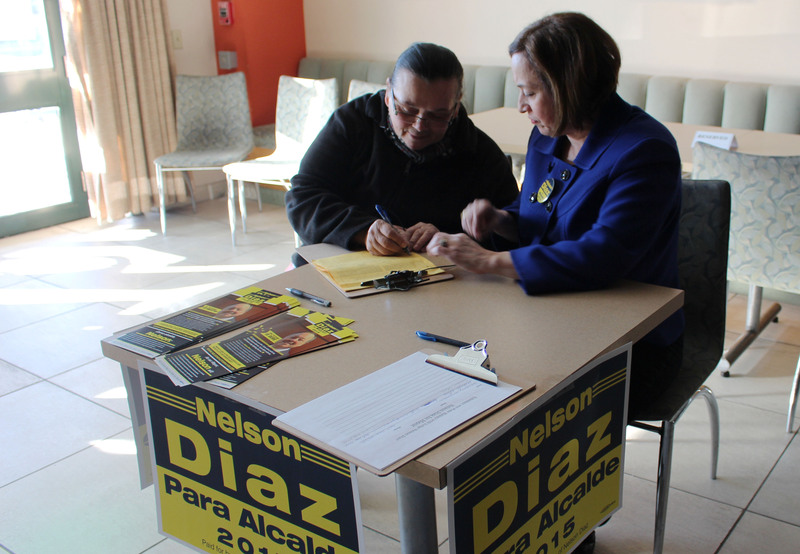 In addition to registering voters and providing general information, mayoral candidate Nelson Díaz and candidate for the District Seven Manny Morales attended the event to greet voters and gather signatures for their petitions. Cruz said he fully endorses Díaz for mayor and that he plans to officially announce his endorsement, along with other Latino Democratic leaders, on March 5 at Casa de España restaurant. He also highlighted the importance of unity within the community and said that he believes Morales is the candidate to achieve that, criticizing Councilwoman María Quiñones-Sánchez for not endorsing Díaz. Members of the Philadelphia City Commissioners Office and the National Conference of Puerto Rican Women (NACOPRW) were in charge of registering attendees, distributing information about the absentee ballot as well as copies of the voter’s guide in English and Spanish. Representing the City Commissioners Office was chief deputy city commissioner Norys Colon-González, who distributed the commissioners’ voter guide, a handbook that — for the first time in Philadelphia — is also printed in Spanish. “You have some people that say ‘I don’t vote because I don’t understand those machines (and) ‘I don’t want nobody coming in with me’ and we can help you with all that,” Colon-González, who said that anyone who would like to obtain copies of the voter’s guide can contact her at (215) 686-3460 or visit the commissioner's office at City Hall, room 132. Gilberto Otero, a North Philly resident for seven years, said he signed Nelson Díaz’s petition and that he can only hope he turns out to be a good candidate. “We are here because we know our vote is important. There are a lot of people who don’t want to get out of their house but we want to see a change in our situation,” Otero said. The last day to register to vote in the primary elections is April 20.